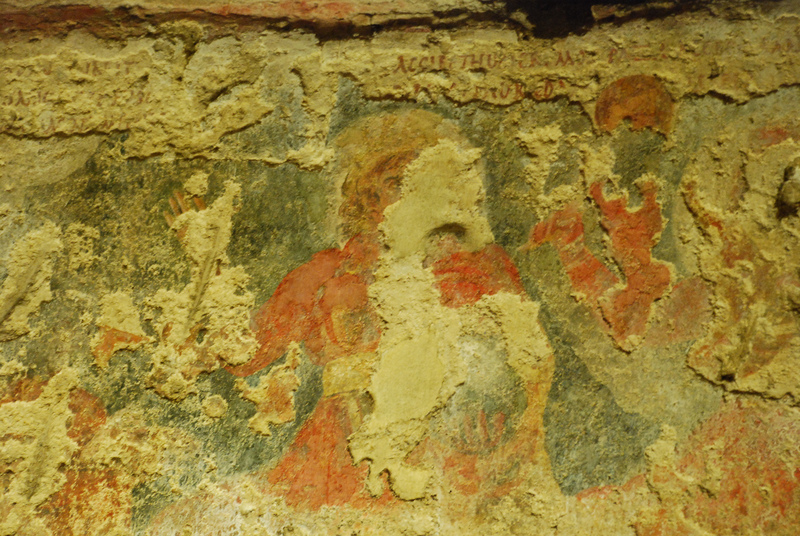 CIMRM 485 - Under-layer: North wall paintings and texts. Santa Prisca, Rome, Italy. See also: CIMRM 476 Mithraeum; 477 Cautes; 478 Oceanus / Saturnus; 479 Tauroctony; Paintings: 480 Upper S. wall, 481 Upper S.(contd), 482 Upper N. wall, 483 Upper, Cave , 484 Under S., 485 Under N.; 486-496 Misc. finds; 497-500 Inscriptions and coins; CIMRM Supplement - Zodiac; Intarsio of Sol. Left/N. wall. Diagram of lower-level figures. 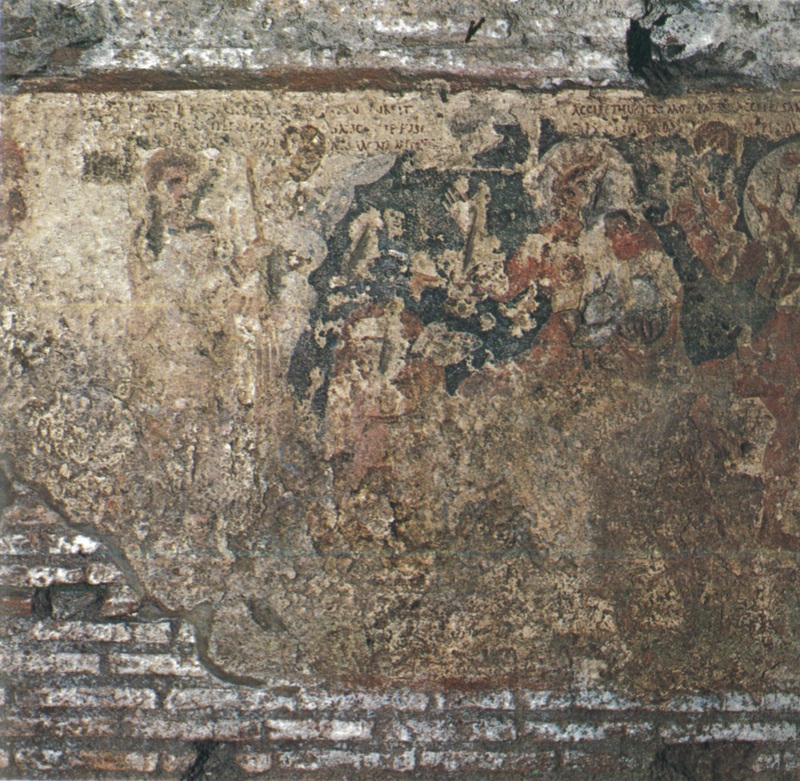 The paintings of the north wall are mainly covered by the upper-layer paintings. But above them are some very interesting texts. Column 1. These three lines are at the start of the left wall. Line 1. "Fecunda tellus cuncta qua generat Pales". (= "Fertile earth, through which Pales procreates everything"). Length of inscription is 0.49 m.; height of letters 0.02 m.-0.018 m.
Line 2. Beneath line 1, and nearly entirely hidden by upper-layer painting. Last word is probably "tibi" (=to/for you). Line 3. Beneath line 2. Possibly: "Unde omn. . laetas .... a( ?) ..... amant sua." Too damaged to translate. 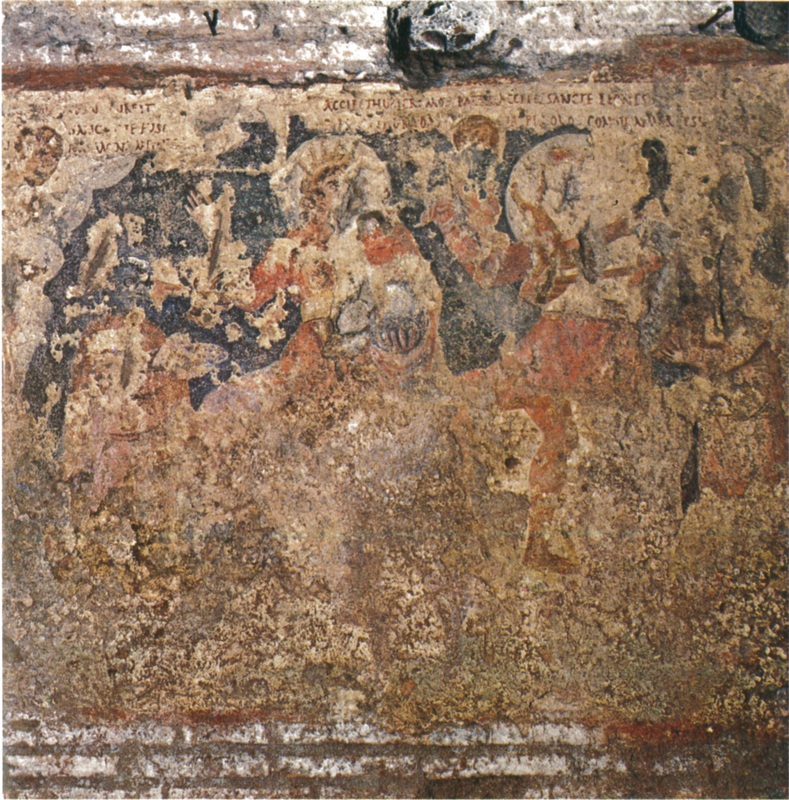 Above the upper-layer cave painting are cols 5-6. From Mysteriae Mithrae. Presumably the next three lines appear in a column, as column 2; but Vermaseren does not state the location of these three verses. Line 4. "Fons concluse petris qui geminos aluisti nectare fratres" (= "Rock-bound spring that fed the twin-brothers with nectar") Top line of a new column. Length of inscription is 0.67 m.; height of letters 0.015-0.018 m. Vermaseren relates this to the "water-miracle" where Mithras shoots a bow at a rock and another figure (sometimes two) scoop up the fluid in their hands; and states that the "water" is, therefore, nectar. Line 5. "Semper siti[s] . .... .". Too damaged to read. Presumably column 3, but Vermaseren does not state the location of these three verses. Line 7. Hunc quem aurs humeris portavit more iuvencum (= "This young bull which he carried on his wonderful shoulders according to his will"). The length of the line is 0.59 m.; height of letters 0.015-0.018 m.
Line 8. Only the start of the line is visible under the upper-layer, and so badly damaged as to be unreadable. Column 4. These three lines are on the central part of the left wall. Line 10. Dulc(i)a sunt fi(cata) avium (s)ed cura gubernat (= "Sweet are the livers of the birds, but care reigns"). Line 12. Nubila per ritum ducatis tempora cuncti (= "You must sustain clouded times together through the rite"). The length of the line (see fig. 68) is 0.66 m.; height of letters 0.022-0.02 m. The reading is beyond doubt. This probably refers to the ritual of initiation. Old monochrome image of column 5. Column 5. See colour and monochrome photos. It is not clear whether the three lines form a single verse or are independent. Line 13. Primus et hic aries astrictius ordine currit (= "Here too the ram runs in front, more strictly in line"). Most letters damaged. The length of the line (see fig. 69) is 0.56 m.; height of letters 0.02 m.
Line 15. fero ut . . a . ? . numina magna Mithre (= "I bring offerings in order that the great powers of Mithras are shown"). The length of the line is 0.61 m.; height of the letters 0.018 m.-0.022 m. Ferrura read unica magna mithis) for the last three words but further cleaning revealed more. Lines 16 and 17. Accipe thuricremos pater accipe sancte Leones, / Per quos thuradamus per quos consumimur ipsi. In these two lines of verse the Father is asked to receive or to accept the Lions. The exact meaning of the words is uncertain, but may be "Accept, O holy Father, accept the incense-burning Lions / Through whom we offer the incense, through whom we ourselves are purified"
This is obsolete but given here for reference only. On the first layer of the left wall there are three lines in the section above door b' on both sides of which are two series of respectively three and two other lines. On this side however, the paintings have suffered very much from the Christians who damaged them with axes. The first two lines above I are yet covered by the upper stratum, but they must have got lost for the greater part. A walking person (Lion) (Nama ..... leoni)is visible with a palm branch in the hand. Primus e[t fug? ]acius sine tu. ordine currit. Viros servasti eternali sanguine fuso. In .ero ut nascent .mina magna Mithra. pir quos tauradamus pir quos consumimur ipsi. We call attention to the fact that this is only our preliminary reading of these highly interesting mithraic hymns. The definitive reading with commentary will be given after the removal of the upper layer of the paintings. Cols 5-6. From Mysteriae Mithrae. Lower-level inscriptions, columns 5 and 6. 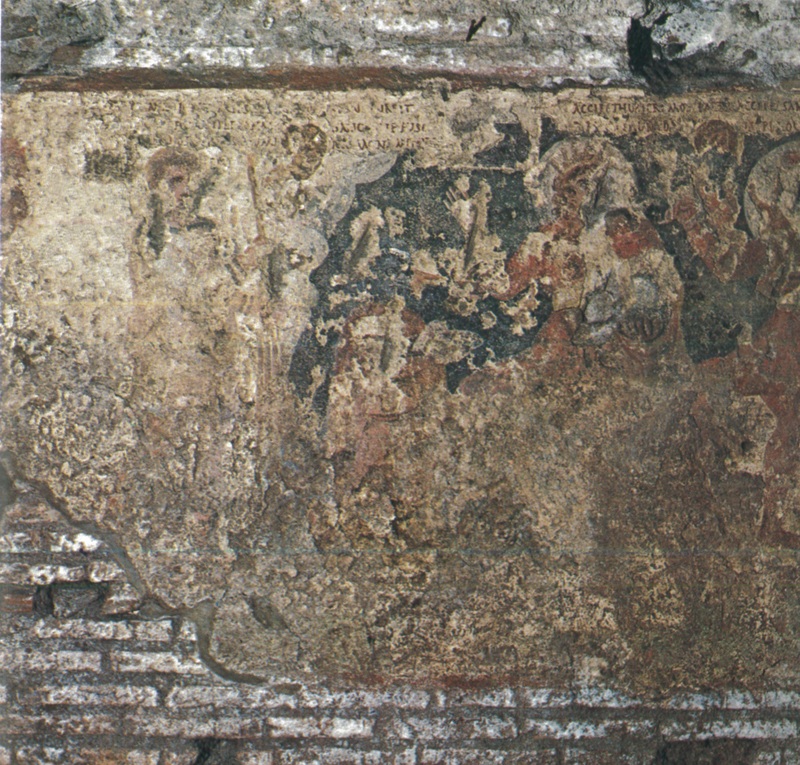 Left wall. Left wall, with inscription column 6 at top right. From Flickr. By spalluza, February 23, 2013. 1 Except where indicated, all this information is taken from Vermaseren-Essen, chapter 21, p.187-240. 2 In Mysteria Mithrae (ed. U. Bianchi Leiden 1979) p.87-126, S. Panciera has an article on, "Il materiale epigrafico dallo scavo del mitreo di S. Stefano Rotondo (con un addendum sul verso terminante ...sanguine fuso)". With photographs and new transcriptions. Panciera (103-105) shows that the reading "servasti eternali" is extremely doubtful. He agrees with "sanguine fuso", however. If correct, then the entire inscription would have to be reevaluated.